A fresh update of a single budget chart shows who's paying for public education in Texas: More than half of the money comes from local property taxpayers, just over a third comes from the state, and the federal government spends about a dime of every dollar schools cost. You might not be running to look it up — only a particular order of nerds do that — but these numbers from the Legislative Budget Board are going to be the centerpiece of a lot of conversations and arguments over school finance for the next two years. That agency, co-chaired by Lt. Gov. 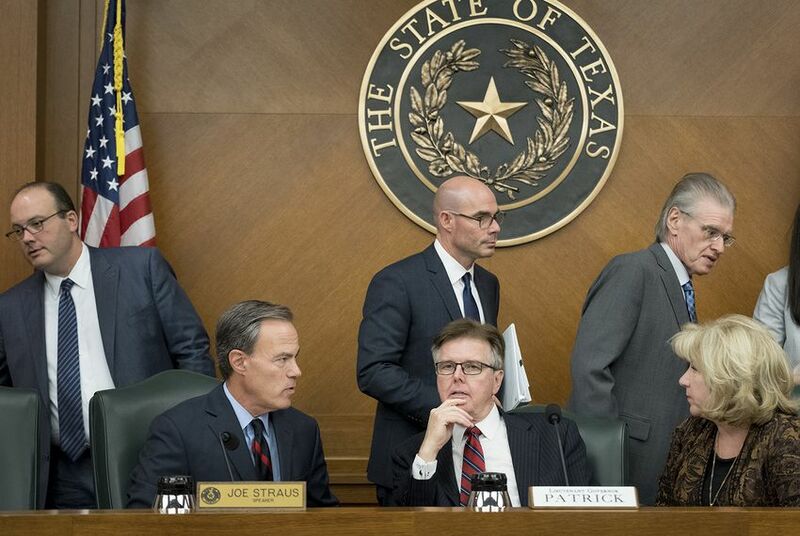 Dan Patrick and House Speaker Joe Straus, has been producing the reports since 1952 to give lawmakers a periodic look at where things stand in the state's budget. This chart tracks what local, state and federal taxpayers have been contributing to public education in Texas over the past decade. Spoiler: The load has steadily shifted to local property taxpayers. Texas is spending 6.3 percent less per student, in constant dollars (stated in 2010 dollars, adjusted for inflation and population), than it was spending in 2010. Overall spending per student, in constant dollars, was $9,845 in 2010 and is projected to be $9,226 in the 2019 fiscal year. The state’s share of public education spending has dropped from 37.6 percent of the total to 35 percent of the total projected for the 2019 budget. The federal share has dropped, too, from 16.4 percent of the total to 9.5 percent in 2019. The local share — the part funded by property taxes — has risen from 46.1 percent to 55.5 percent. If you look two years earlier — back to the 2008 school finance budgets that followed the Legislature’s last rebalancing of school budget formulas — some of those shifts are even starker. In 2008, lawmakers set the balance — the shares covered by each government — at about 44.8 percent local, 44.9 percent state and 10.3 percent federal. Today, those levels are 55.5 percent local, 35 percent state and 9.5 percent federal. Those numbers are the source material of complaints that the state has shifted the burden of public education to local property taxpayers, all while state lawmakers and budget-writers have been critical of what they call spendthrift school boards and educators. In actual dollars, spending appears to be way up. The tab for public education in Texas in fiscal 2010 was $44 billion. In 2019, it’s projected to be $55.4 billion. That’s a 25.8 percent increase. Over that same period, however, the student population grew to 5.2 million from 4.5 million. And when you extract inflation, overall spending dropped 6.3 percent in constant dollars: What was $44 billion in 2010 slides to $41.2 billion in 2019 — even as about 700,000 more kids are added to the school population. That’s a lot to chew. A couple of interim studies are trying to make sense of school finance in advance of the legislative session that begins in January. It’s not easy work, if only because the numbers are so big. If you applied 2008’s shares of the public education load to today’s numbers, the system would need $6 billion less from local school districts, about $5.5 billion more from the state, and about $438 million from the federal government. Those are one-year numbers, and it’s a running problem — not a one-time fix. To keep the state and local shares at about 45 percent each, state lawmakers would have to find $9 billion for the next two-year budget. Here’s another spoiler: They don’t have that kind of money lying around. Correction: An earlier version of this column didn't account for population growth as part of the constant-dollar spending on public education. That spending grew 15.6 percent — not 18.9 percent — from 2010 to 2019.